For those of you that have followed along with me for a while, you know our family has a soft spot for Rice Krispies Treats. 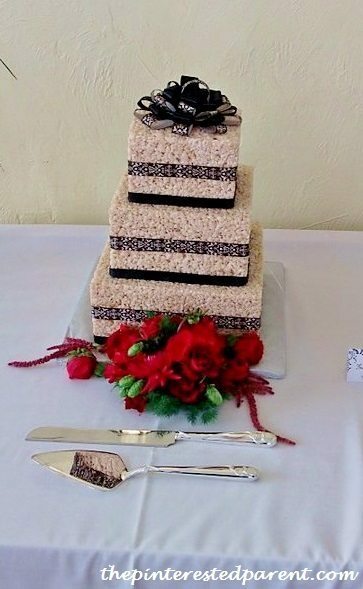 Our wedding cake was even fashioned out of 3 tiers of solid Rice Krispies Treats. We have been eagerly anticipating spring here. It has been a week of rainbows in our home. 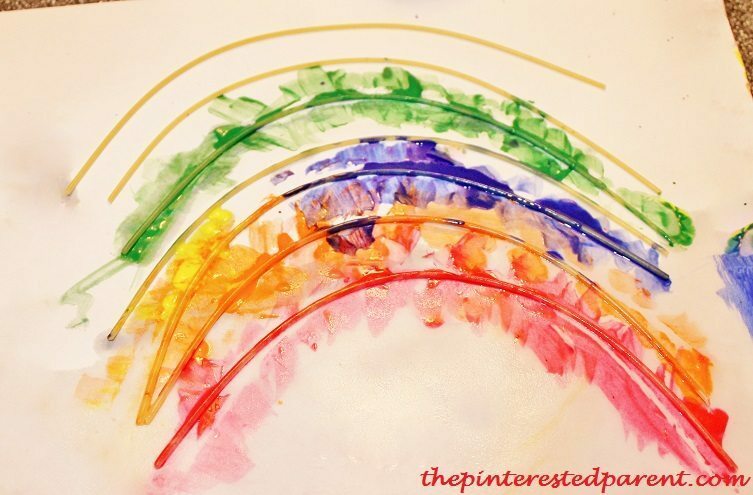 We painted some spaghetti rainbows over the weekend. 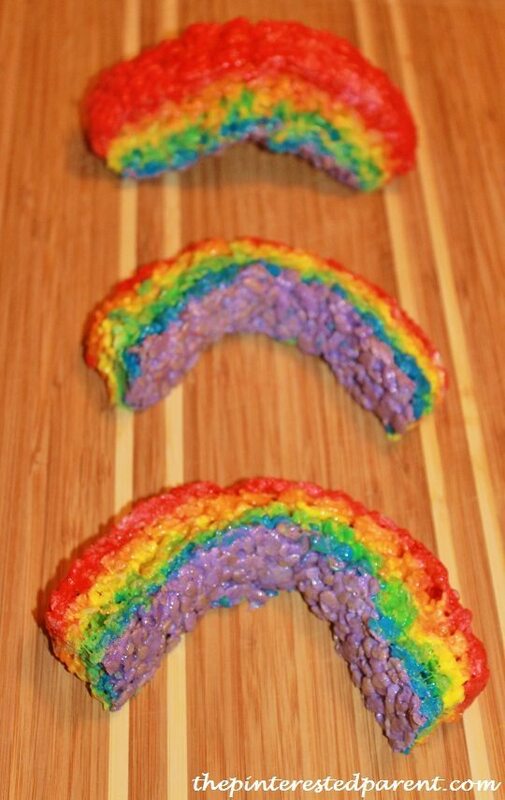 Then today we made some Rice Krispies Treats Rainbows. 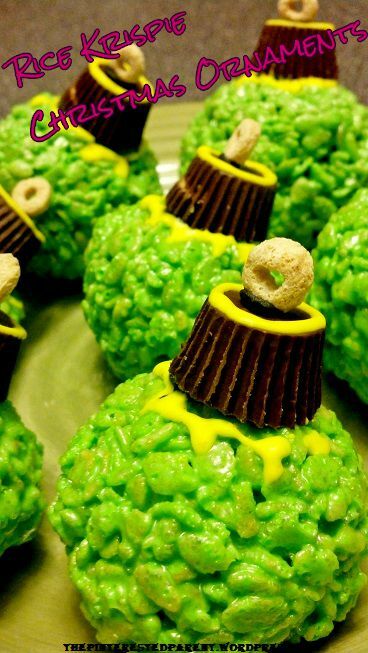 We have made these before for parties and such, but tonight the treats were just for us. 1. 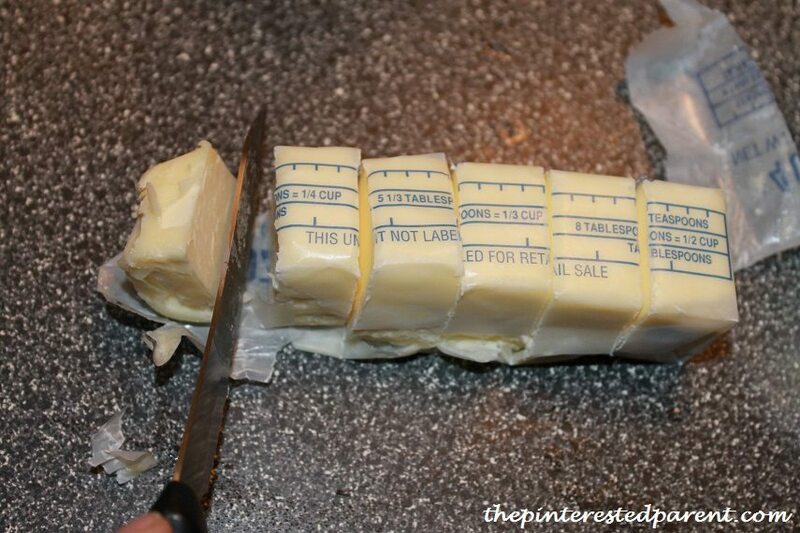 Slice a stick of butter into 6 equal parts. 2. 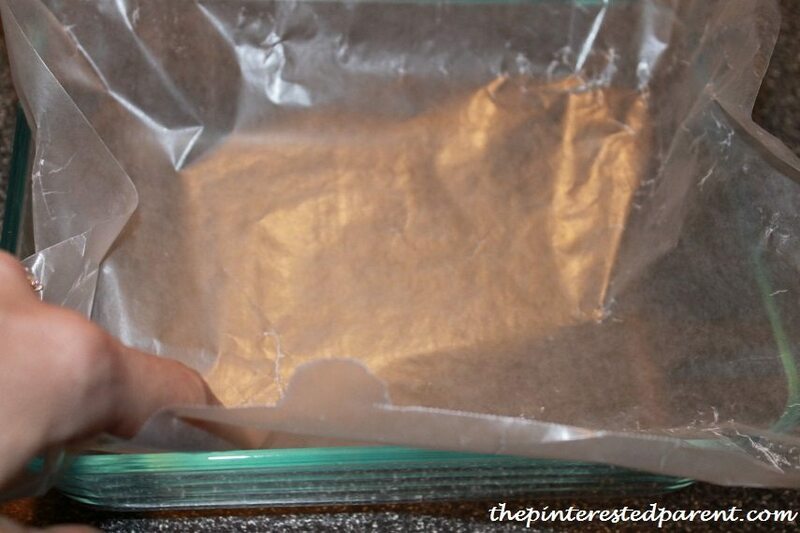 Line a small baking pan with wax paper. We used a 7X5X1.5. Spray the paper with cooking spray. 3. 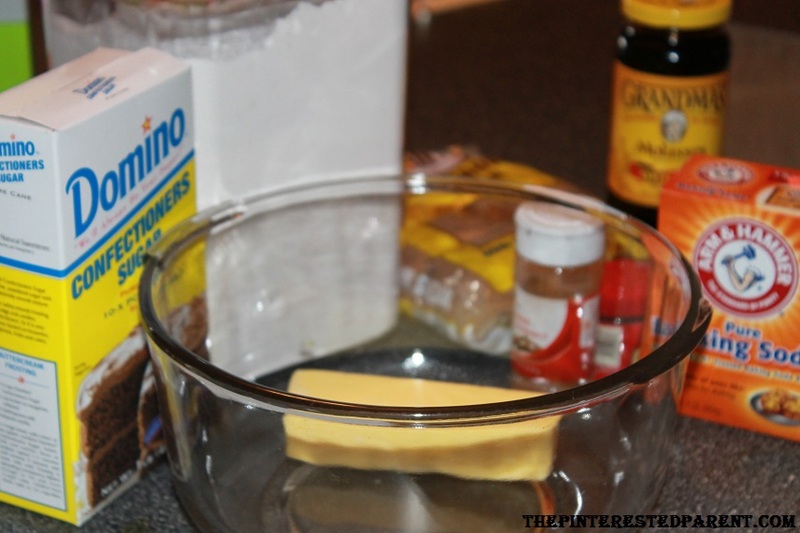 In a small sauce pan, melt one pat of butter over low heat. 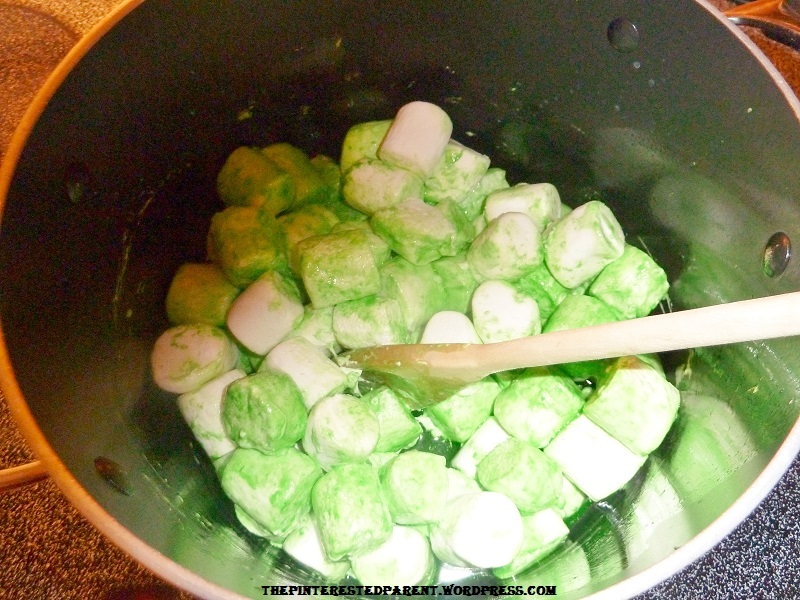 Stir in 6-7 medium sized marshmallows cut up into smaller pieces. Stir until melted. 4. 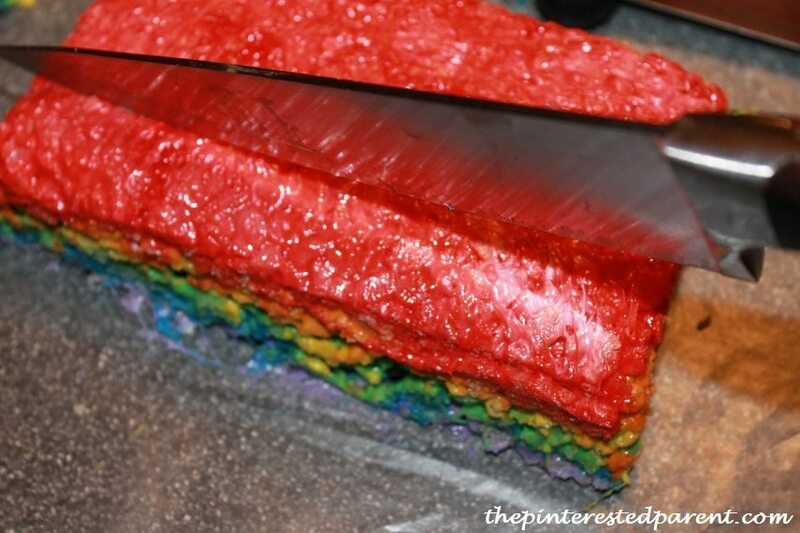 Add a few drops of red food coloring until you get the achieved color. 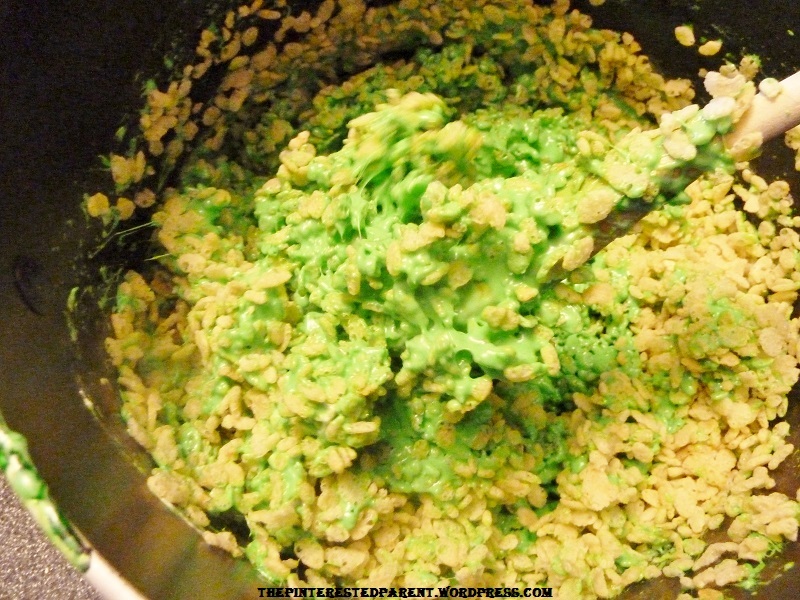 Stir in 3/4 cup of Rice Krispies until well coated. 5. Press the mixture into the bottom of the pan, packing it well. Use fingers to press in well. 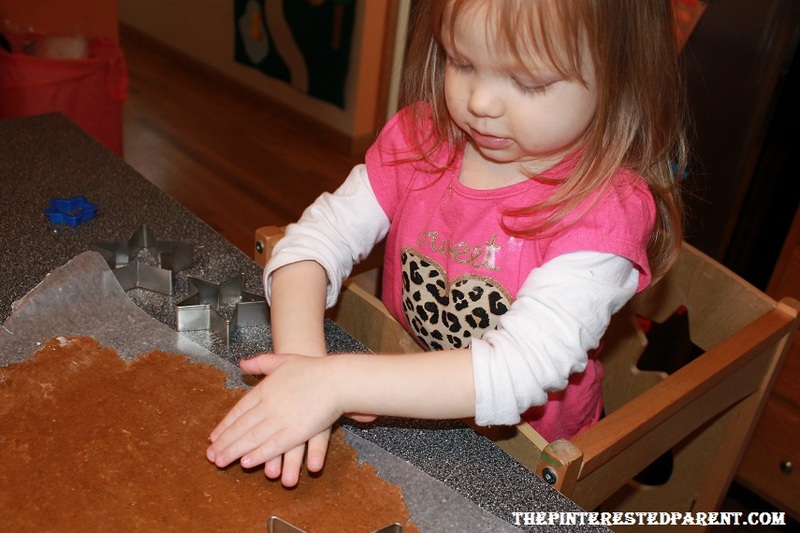 Wet hands work best & keep the Krispies from sticking to fingers. 6. Repeat steps 3-5 five more times with the remaining colors, layering each color on top of the last. 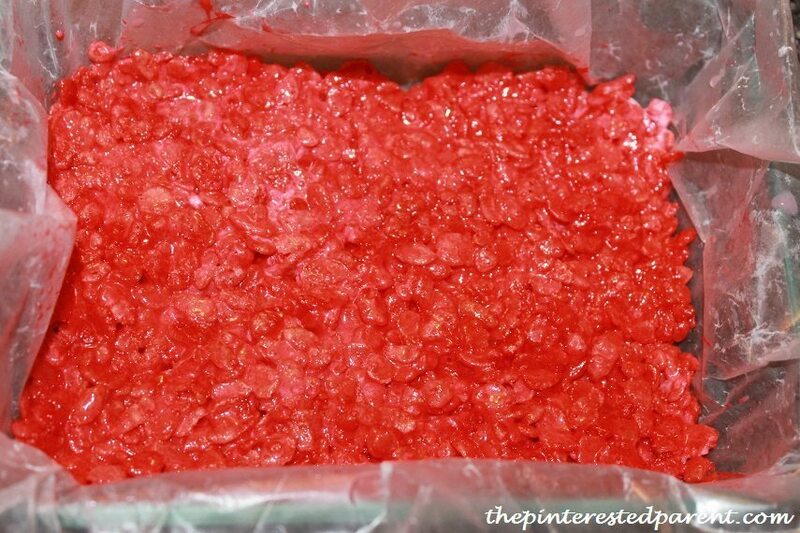 Let cool in the refrigerator for about 10-15 minutes and then lift the treats out by the wax paper. 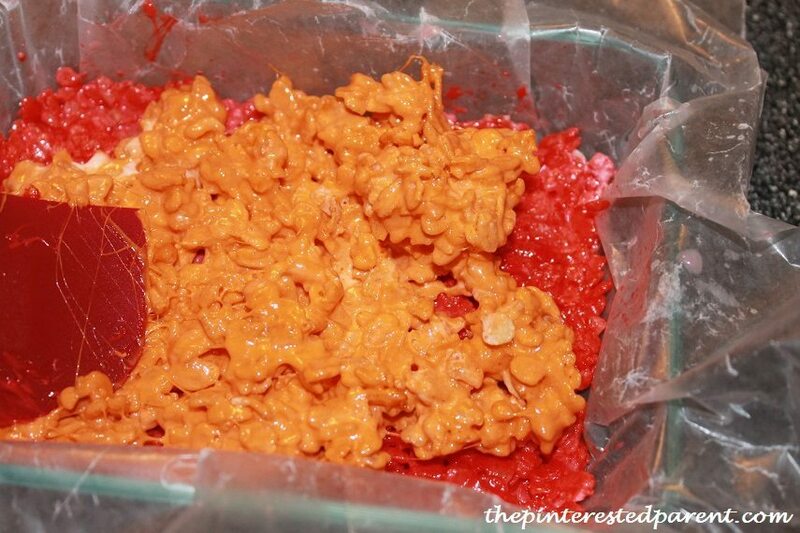 Peel off the wax paper from the treats. 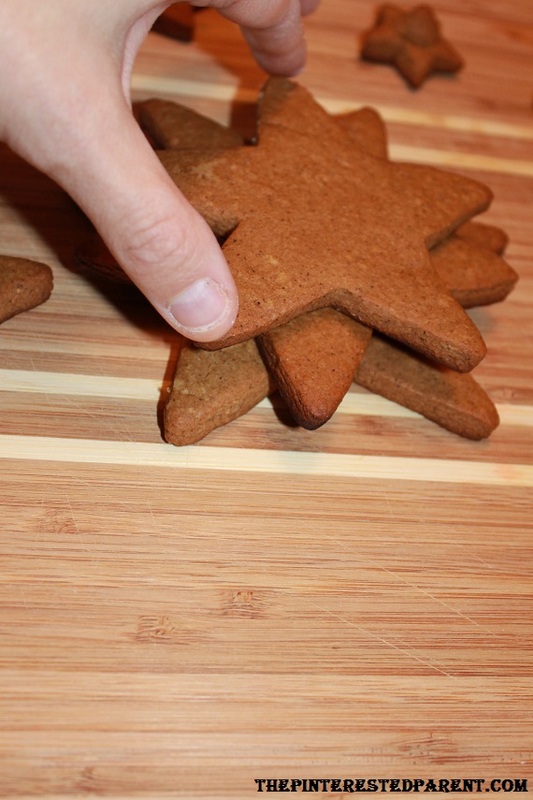 Use a sharp knife to slice the treats in to thin strips. 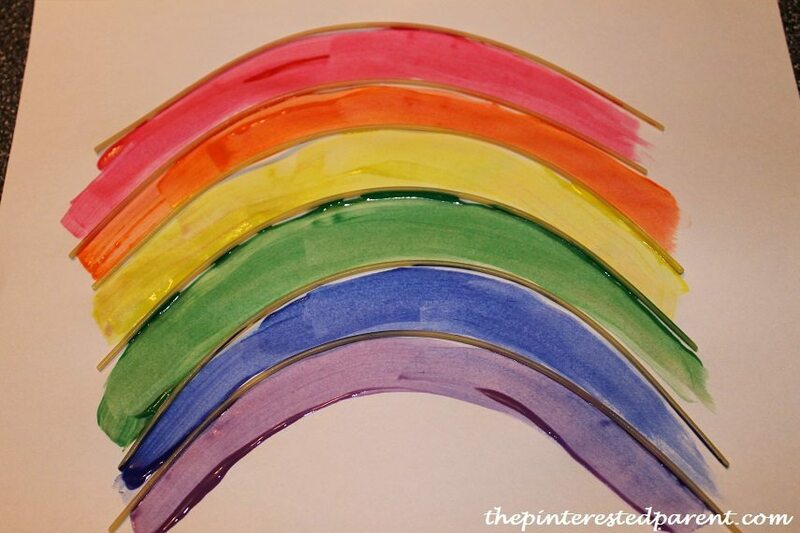 Curve your strips into arcs to form rainbows. I realize that it is not even Thanksgiving yet. It’s not that I have anything against Thanksgiving because I have a lot to be thankful for, but I am overjoyed for this upcoming Christmas season. I understand that most do not like how early the holidays seem to come more & more each year, but for me I can’t wait, especially after having our daughter. Christmas is magical. The Christmas carols, the twinkling lights & the smells are all divine. I am one of those people that have gotten into the spirit a little bit early, but I don’t care. My daughter doesn’t know any different. To her it is Christmas time already. 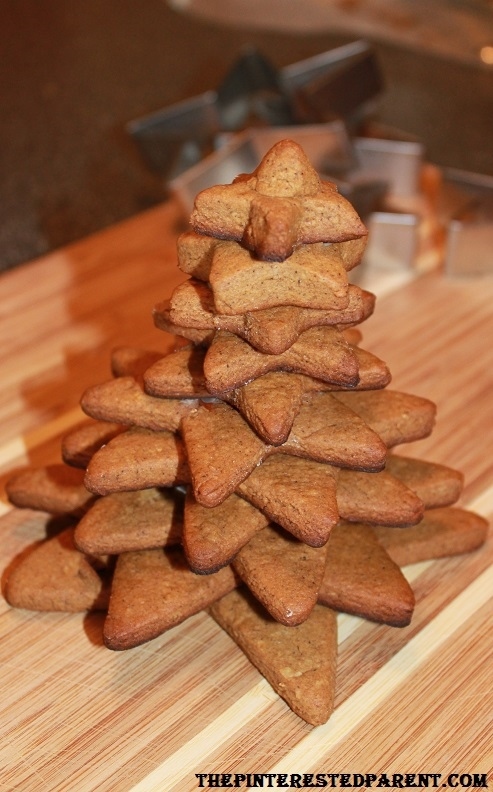 This weekend we put on some Christmas carols & filled our house with the delicious smell of gingerbread. 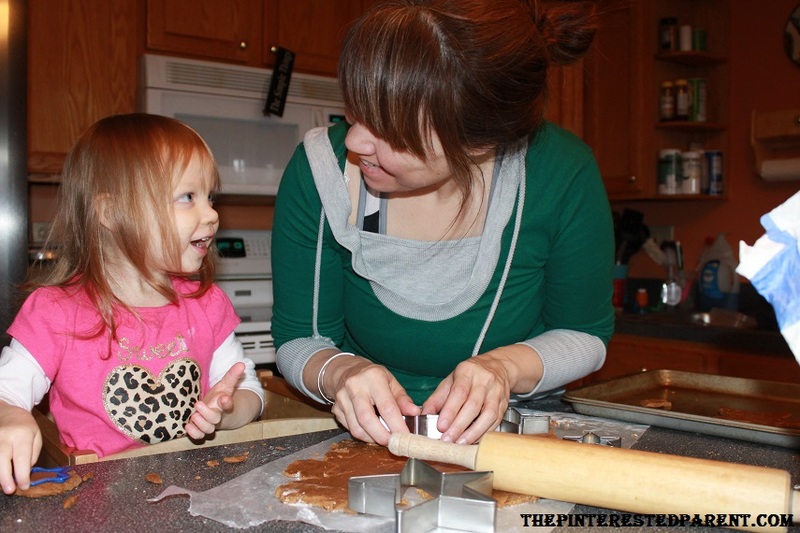 My daughter loves baking with mommy & she loves eating it too. 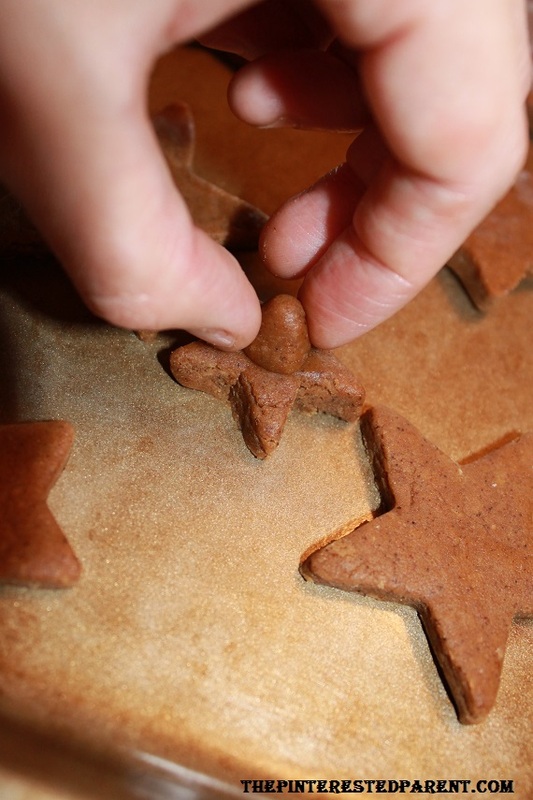 One of the great things about gingerbread is it has the same consistency as Play-Doh. This of course made my Play-Doh obsessed daughter happy. 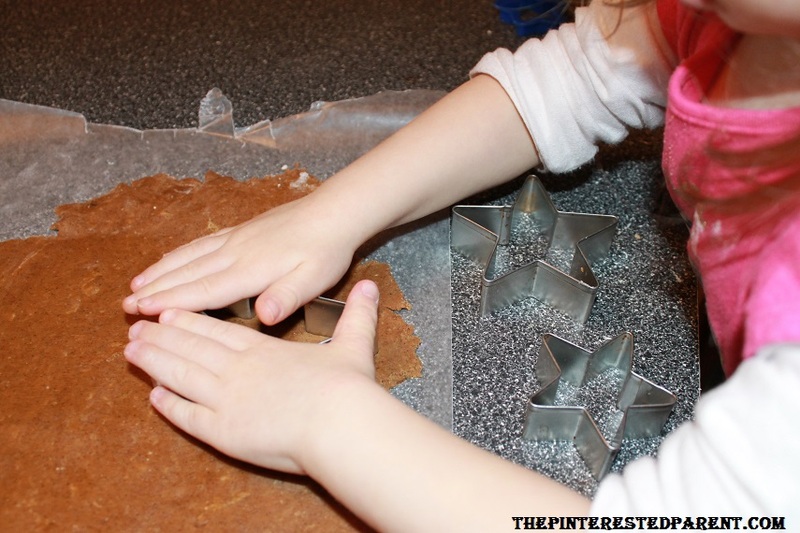 You will need star cookie cutters. Using different sized cookie cutters, cut out about 10 cookies. If you do not have 10 different cutters, you can improvise. I had 5 cutters in various sizes. I cut two of each size, cutting one a little thicker than the other. 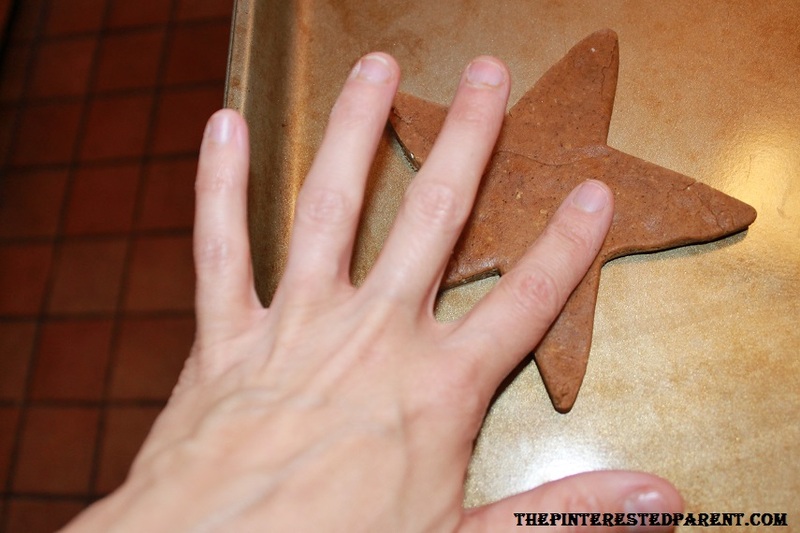 I worked the thicker star out carefully using my fingers to make it a little bit larger than the first star. On the smallest star I added a small point for the top of the tree. 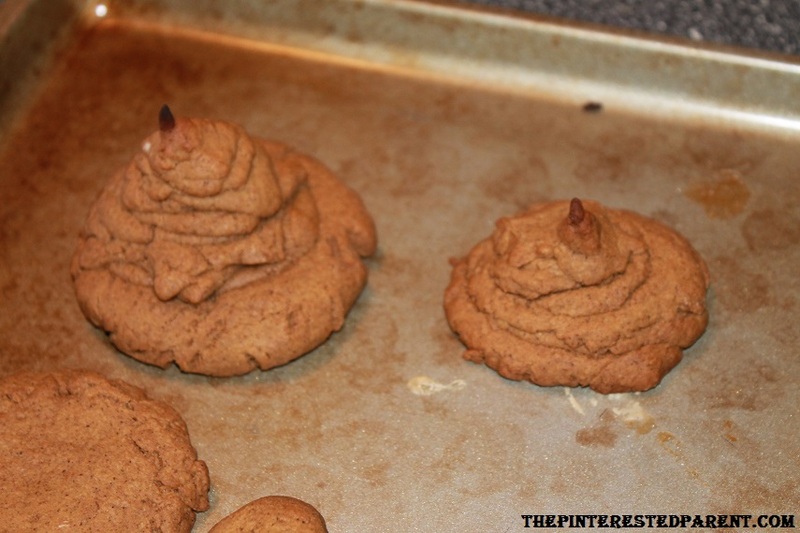 Bake your cookies according to the recipe. 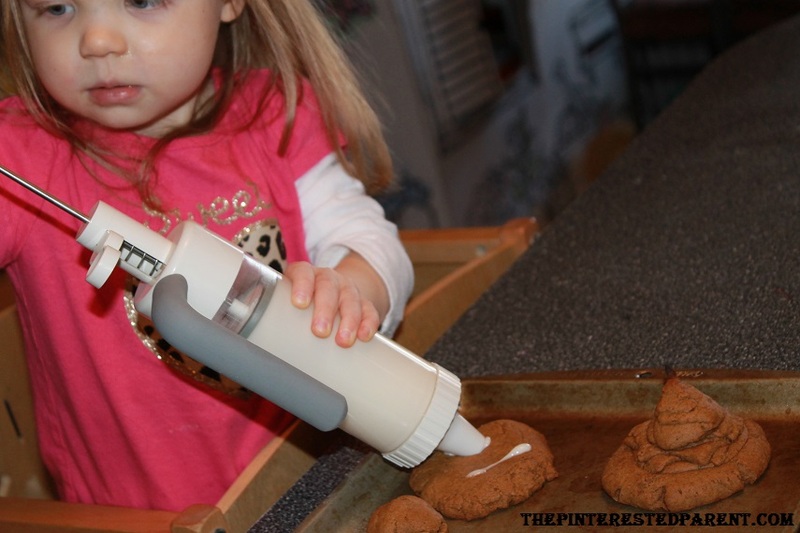 Make your icing while the cookies bake. Stir your ingredients together until smooth. 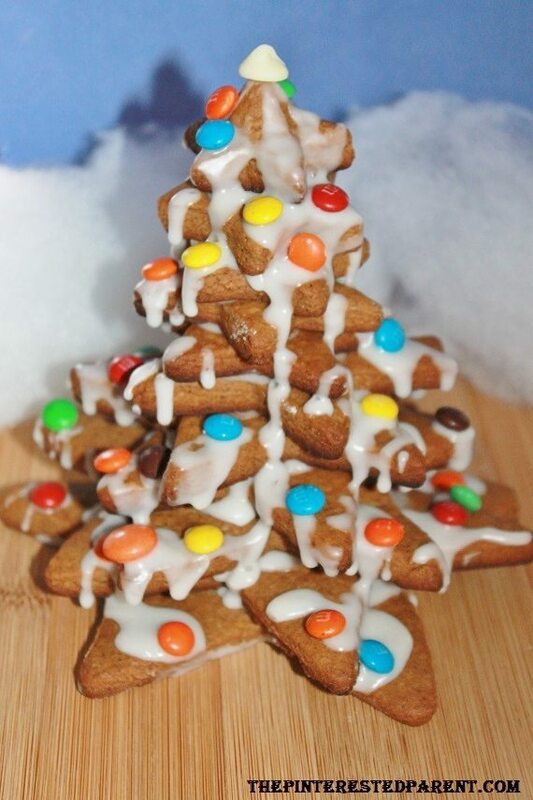 Stack the cookies from biggest to smallest. Use the icing to hold the pieces together. 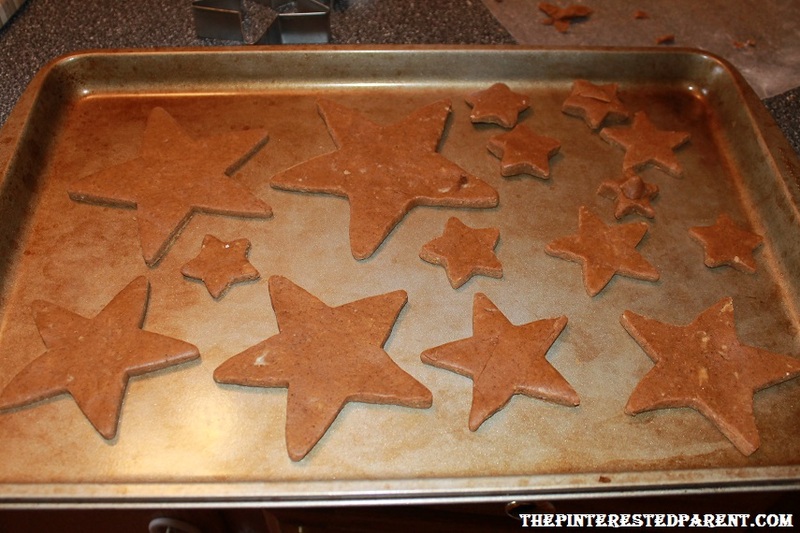 Stagger the star points so that they lined up every other cookie. Drizzle icing over the top of the tree & add M&M minis or another candy of your choice. 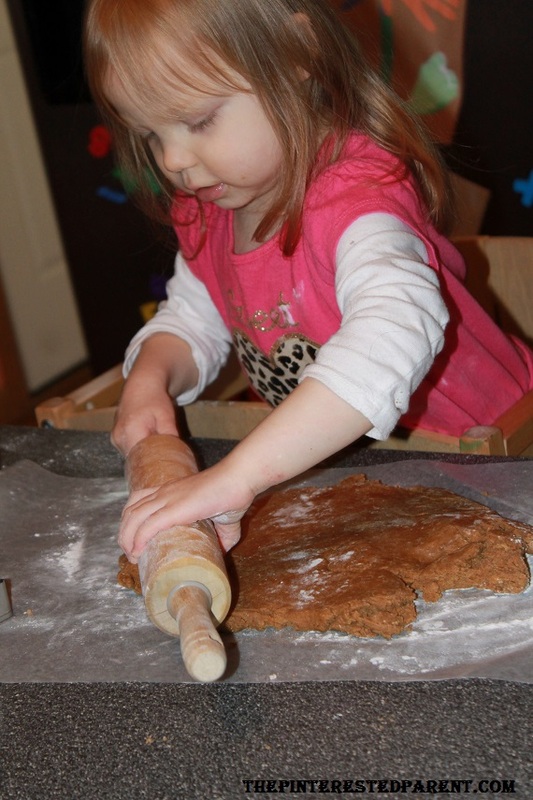 As I said already the gingerbread dough has a similar consistency to Play-Doh. I let my daughter use the leftover dough to craft her own cookies. She crafted these as birthday cakes for me & her. The birthday cakes looked a bit like a pile of something else that I don’t want to say, but otherwise they still tasted delicious. Mai iced up her cookies and they passed her taste test. 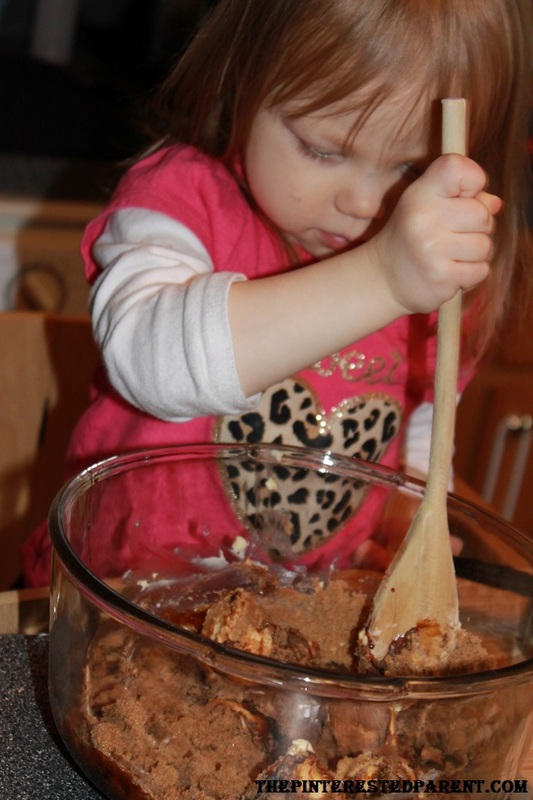 The only problem was trying to wrestle away all of her cookie creations from her so that she didn’t eat them all. 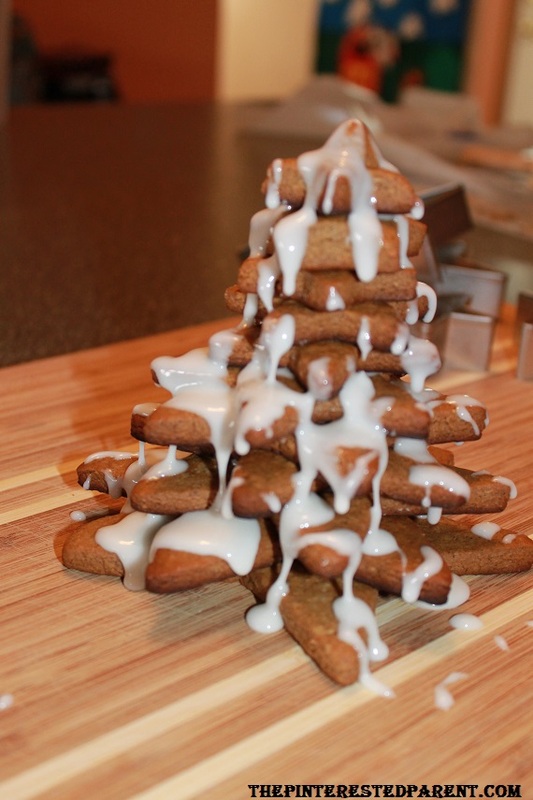 We also made these cute little trees imparting the same concept of stacking the stars as with the cookie tree. We cut out 10 different sized stars using foam sheets & cut out a hole in the middle of each big enough to fit around a toilet paper roll. 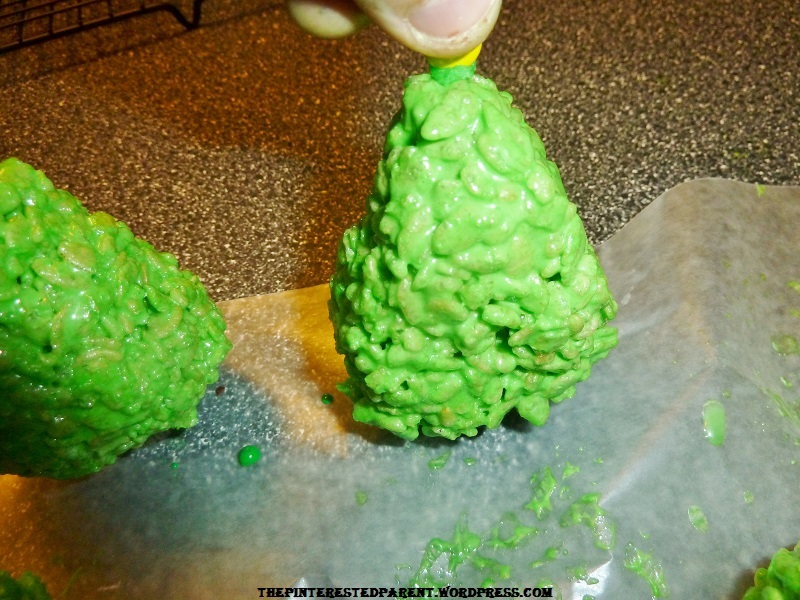 Cut only a small hole in your top star & loop a pipe cleaner through it to for the peak of the tree. 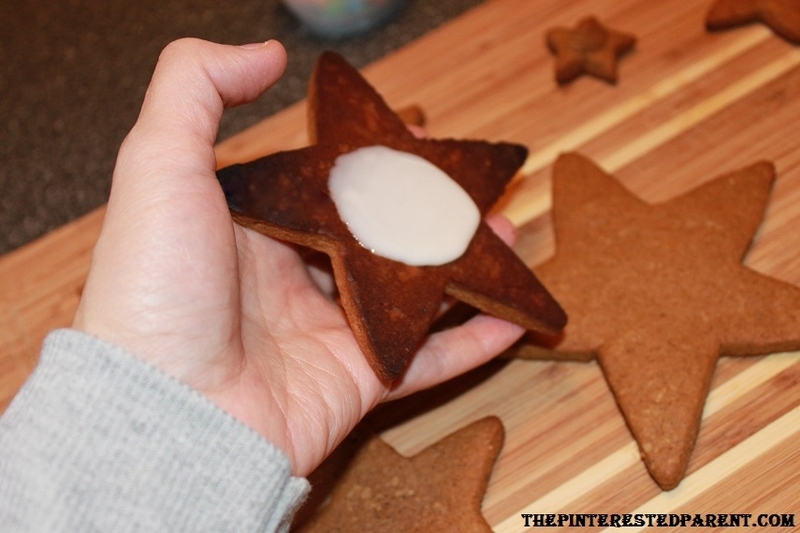 Attach 2 small foam stars to either end of the pipe cleaner. 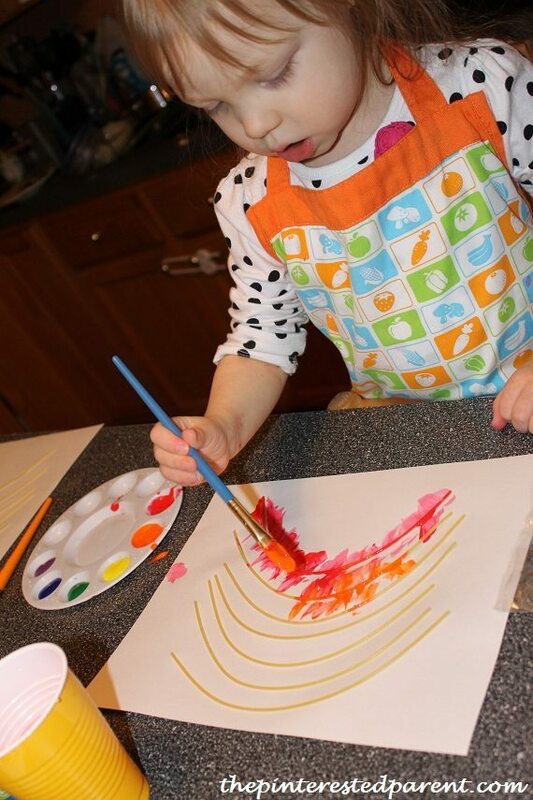 Paint a toilet paper roll & a Dixie cup (The Dixie cup will be used for your base. Let dry. Glue the toilet paper roll into the cup. Stack the stars from biggest to smallest over the toilet paper tube & glue the top star over the top of the toilet paper roll. 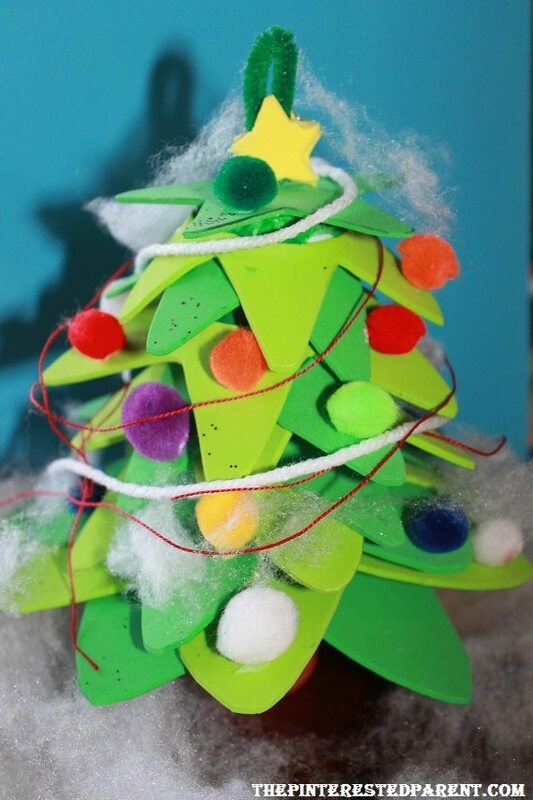 Let dry & let your child decorate the tree with craft pom poms, yarn, cotton snow etc. I love decorating for the holidays. Nothing fills me up with Yuletide cheer more than surrounding myself with all things Christmas. It is not just the Christmas tree & mantle that gets adorned in our house, our meals get a makeover for the season as well. 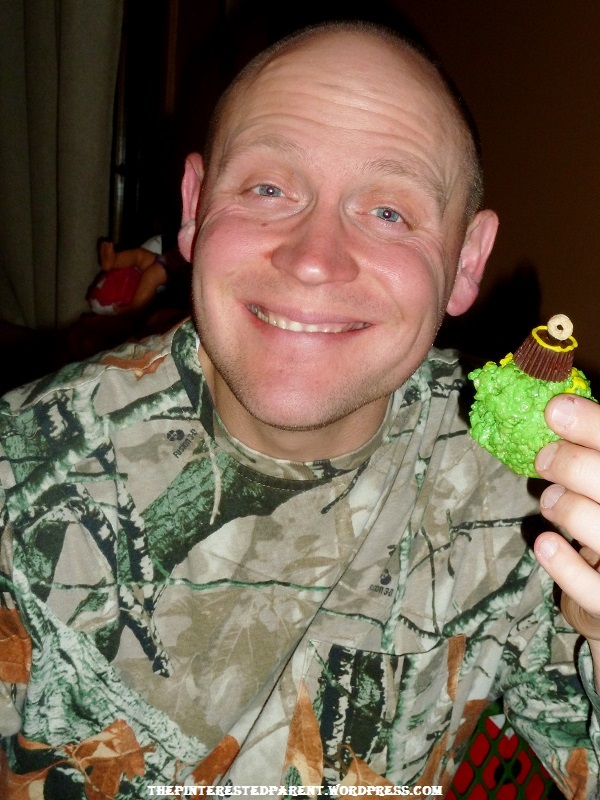 Don’t let the cookies have all the fun. 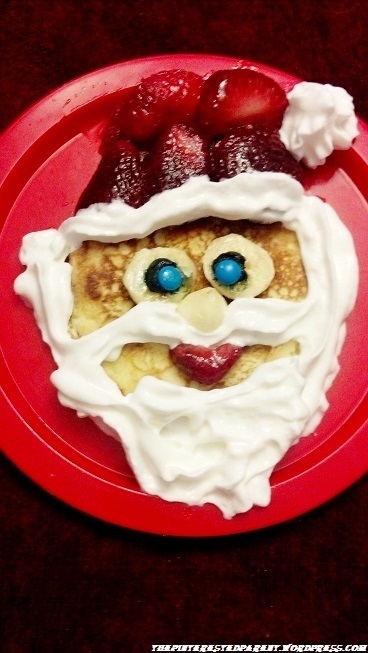 Here are some fun & easy ways to dress up everyday meals for the holidays. 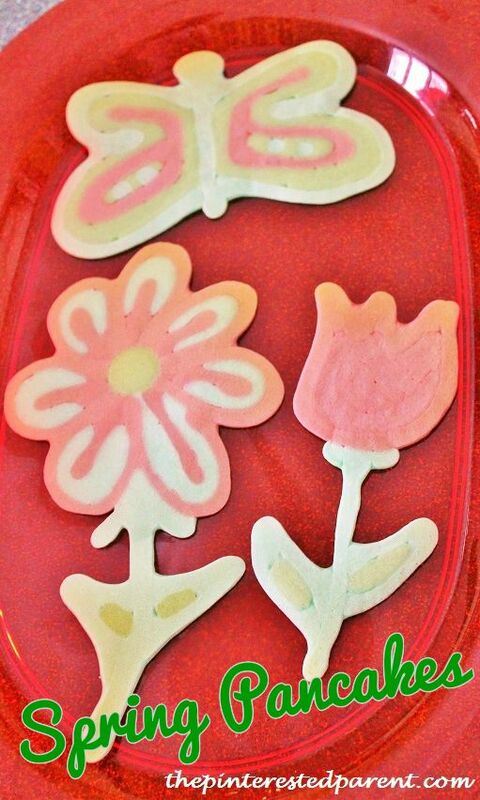 One of the quickest & easiest methods for adding a festive touch to ordinary foods are with cookie cutters. 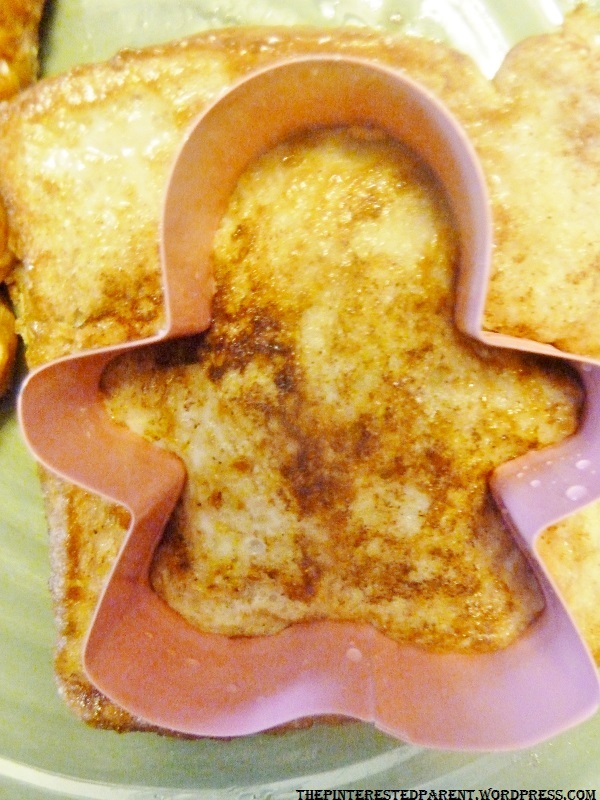 French toast can easily be transformed into the shape of a gingerbread man with one press of the cutter. Mai loved this. 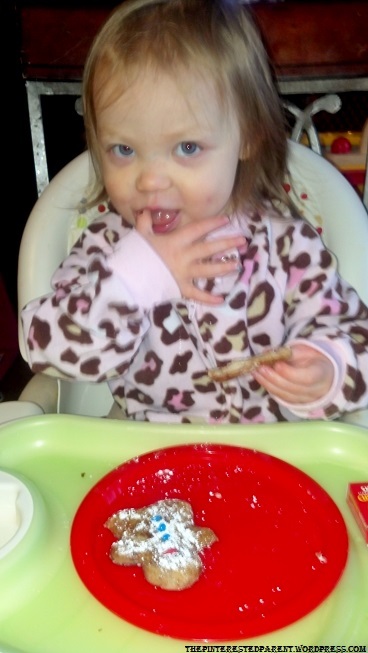 She thought they were cookies & gobbled her toast right up. This was achieved with 3 russet potatoes. Peel, wash & cube potatoes. Add to a large pot of boiling water & cook until tender. Drain potatoes & add 1/2 cup of milk, I use 2 chicken bouillon cubes in lieu of the butter, mash ingredients together. Add 2 eggs & 1/4 cup of parmesan cheese, 1/4 cup of bread crumbs, 1/2 tsp of garlic salt & a 1/2 cup of cheddar cheese & mix well. Let cool slightly & roll out 3 balls of varying sizes. 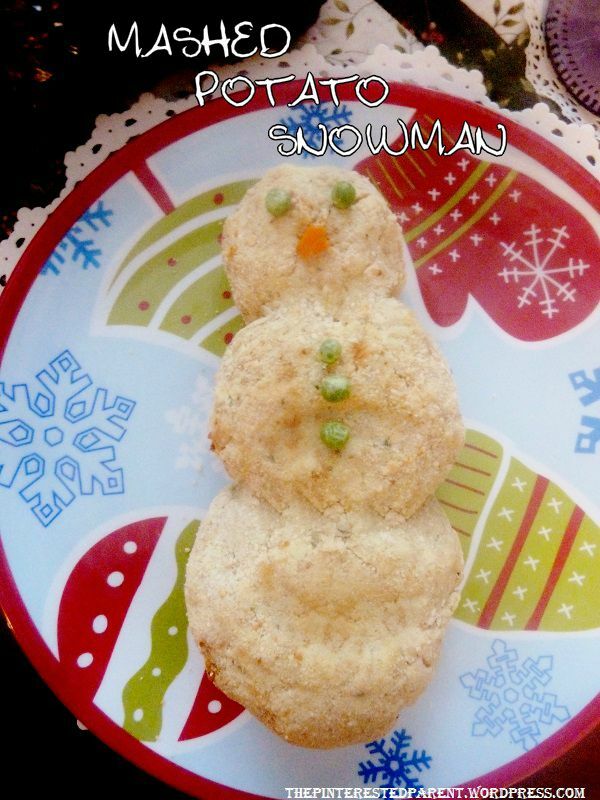 Roll formed balls into parmesan cheese & form your snowman shape & place on a greased baking sheet. Bake at 400 for about 15-20 minutes. Add carrots & peas as a garnish. Cook spaghetti & add your favorite sauce. Use two tubes of seamless sheets of bread dough or crescent dough. Roll out both tubes blending together the sheets vertically. Cut out a candy cane shape about 3 inches wide. 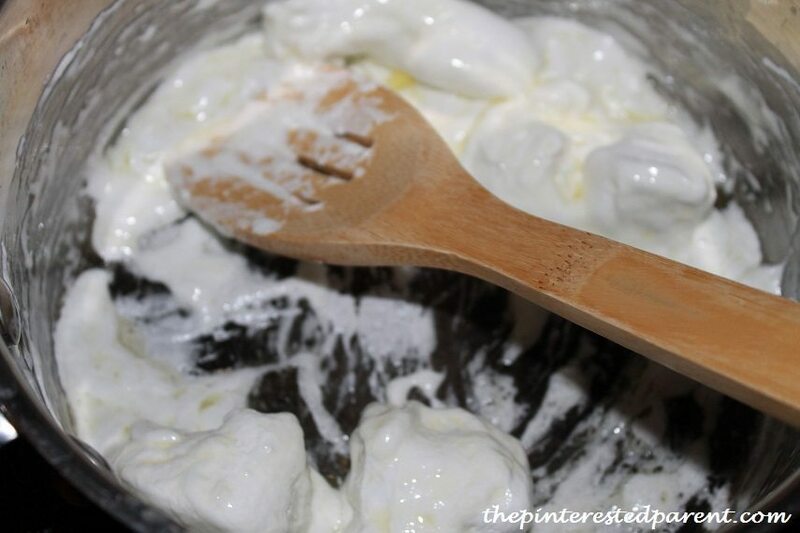 Using a fork, scoop out spaghetti & place on the dough. 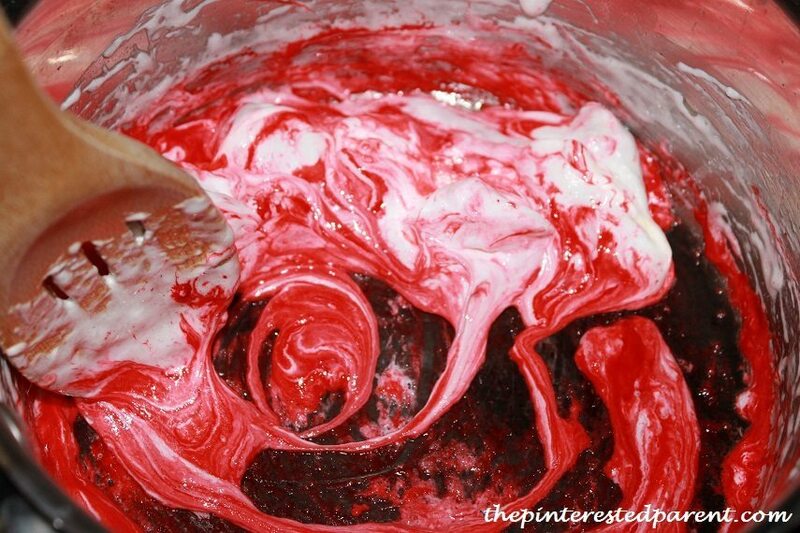 Spoon out extra sauce over the spaghetti to add the red to your candy cane. 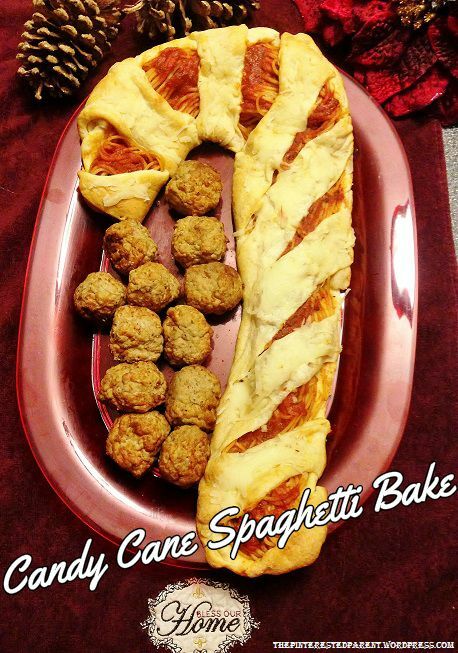 Roll out the excess dough & cut into strips and lay across the top of the pasta in a diagonal pattern to form candy cane stripes. Using a knife push the dough into the side of the cane & smooth out the sides of the dough. Bake according to dough directions. This is a 2 minute meal that the kiddos will love. 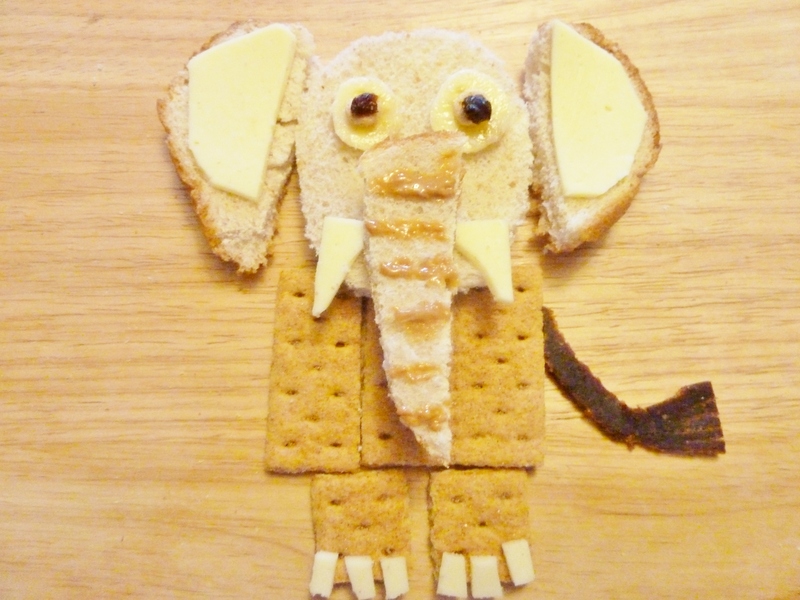 Use one piece of bread, cut out an oval shape for the head & spread with peanut butter. Add a rounded teaspoon of jelly to the add the nose. 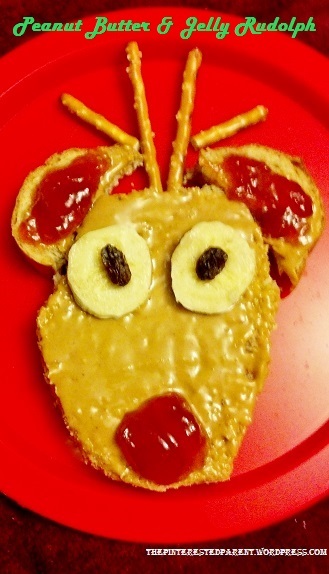 Use the rounded top of the bread as ears & spread with jelly. 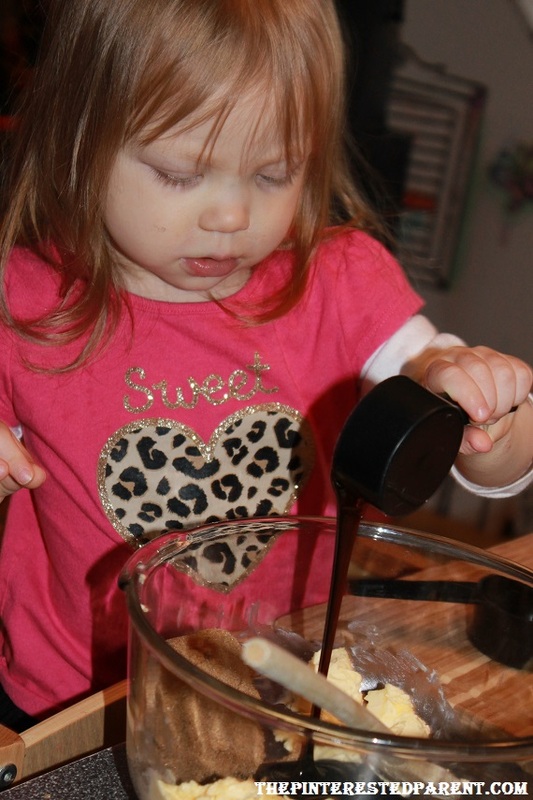 For the eyes use two chunks of banana & 2 raisins. Pretzel stick will finish off the reindeer as antlers. One pancake, topped with banana, icing & 2 M&M minis for eyes. Form a nose out of banana & the mouth and hat from strawberries. Top with whipped cream for the beard & fur trim for the hat. 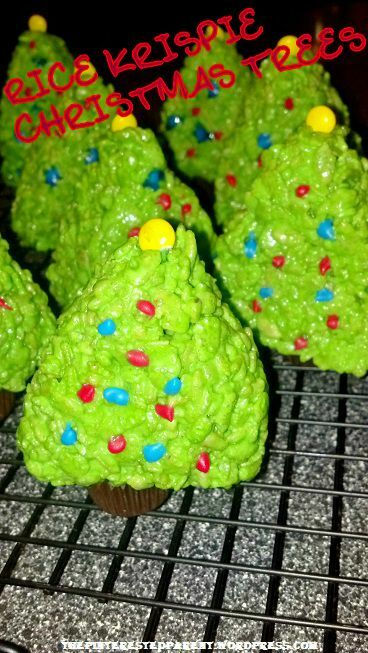 Share some of your fun Christmas creations. We would love to see them. 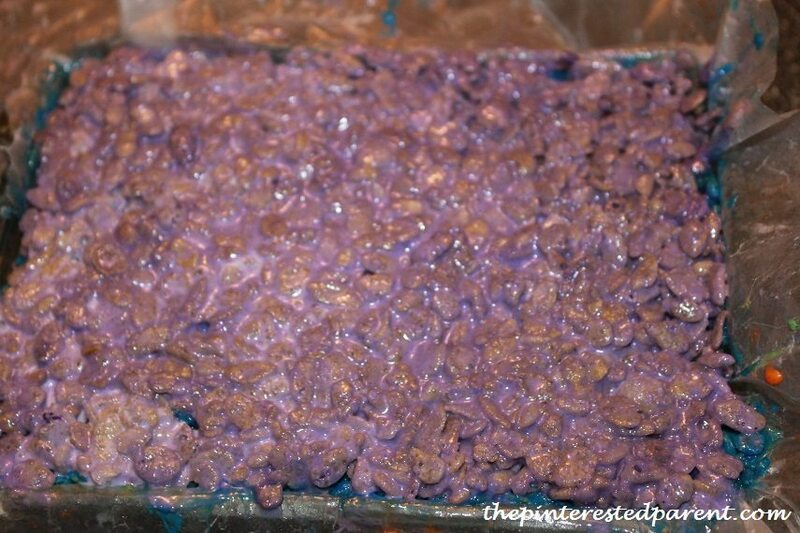 I think it is safe to say, that most people like Rice Krispies treats. What’s not to like? They are easy to make, sweet , gooey & just so darn delicious. My husband & I like them a bit more than the average person. 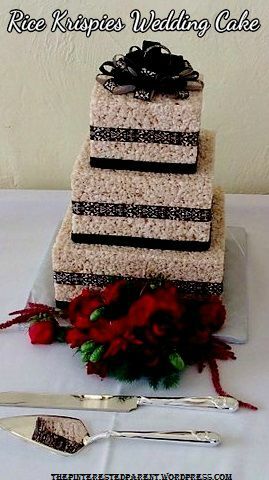 If you don’t believe me, how many of you had your wedding cake made out of Rice Krispies treats? 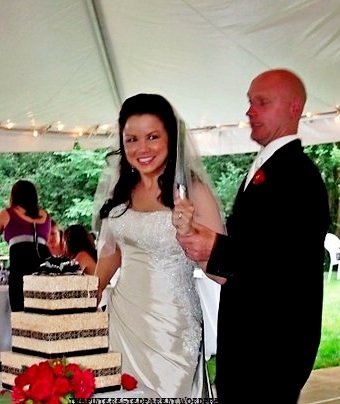 It is a lot less messy during the cake feeding, but it hurts a lot more if you smash it into your spouse’s face. 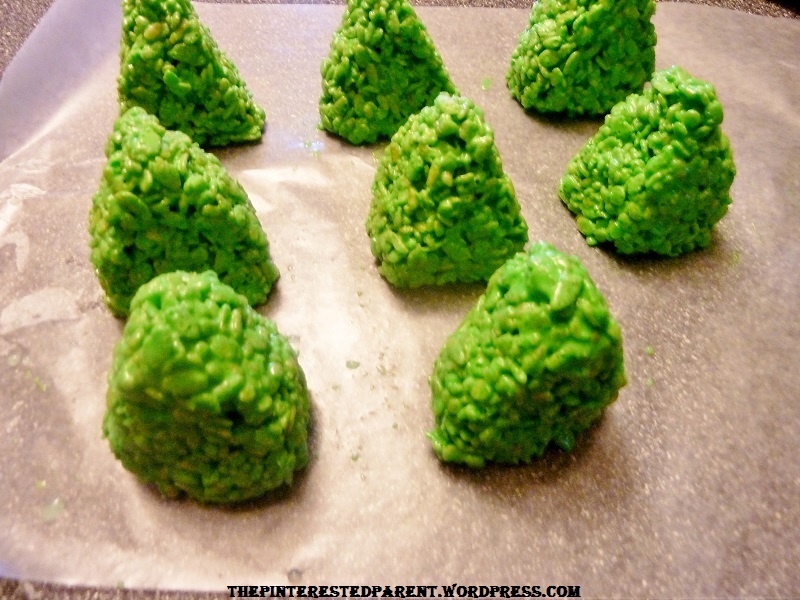 You can imagine my excitement when I was at the checkout counter of the grocery store & saw a magazine cover featuring a Rice Krispies Christmas tree. 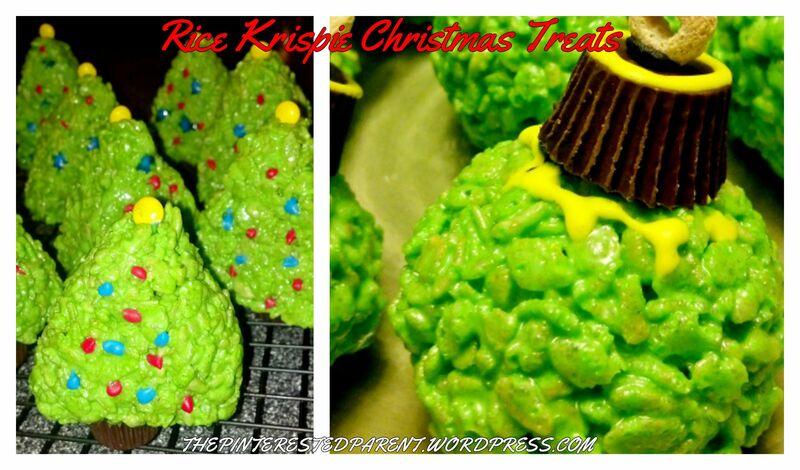 I already had an idea for making Rice Krispies ornaments & was anxious to try them both. I immediately took mental stock of my ingredients. All I needed was some marshmallows. 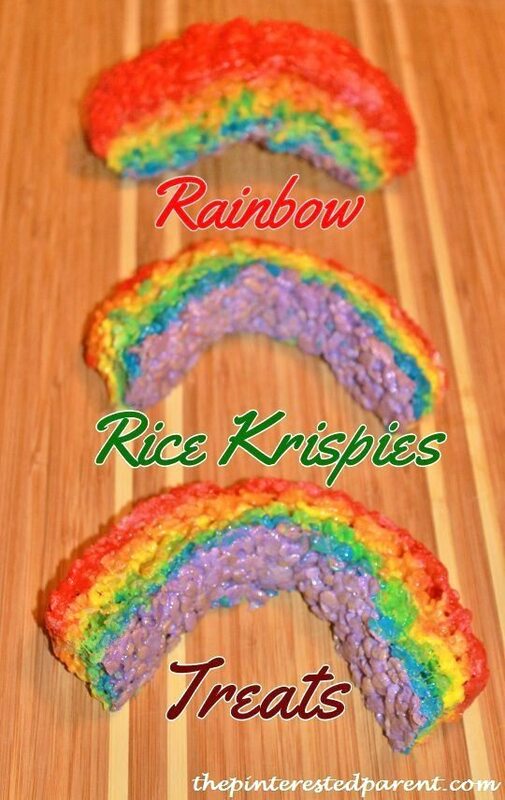 Just in case you don’t stock all the ingredients for Rice Krispies treats handy, here is what you need. 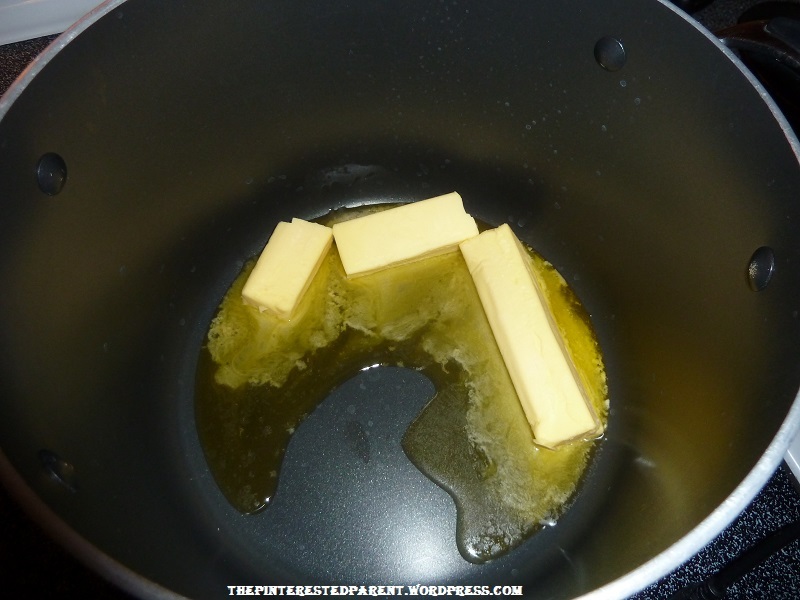 1.In a large saucepan, melt butter over low heat. 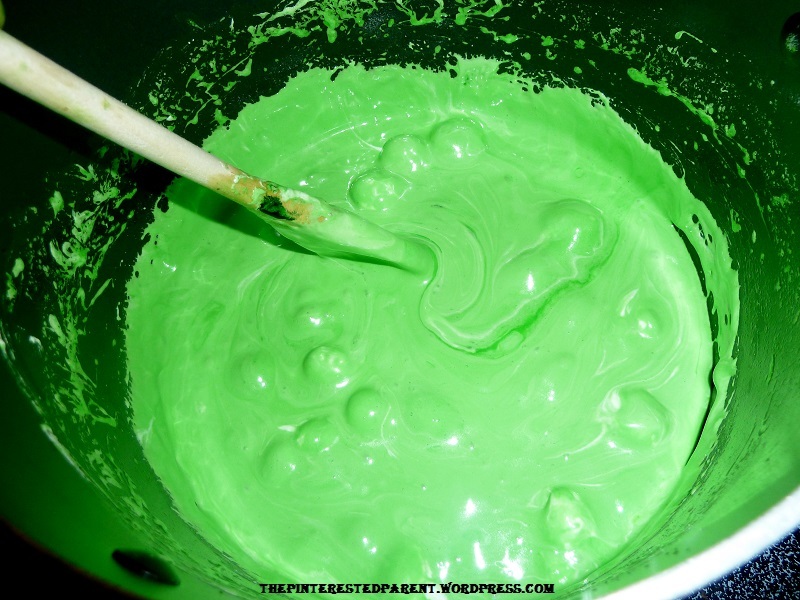 2.Stir in marshmallows & food coloring until you achieve desired color. Stir until completely melted . 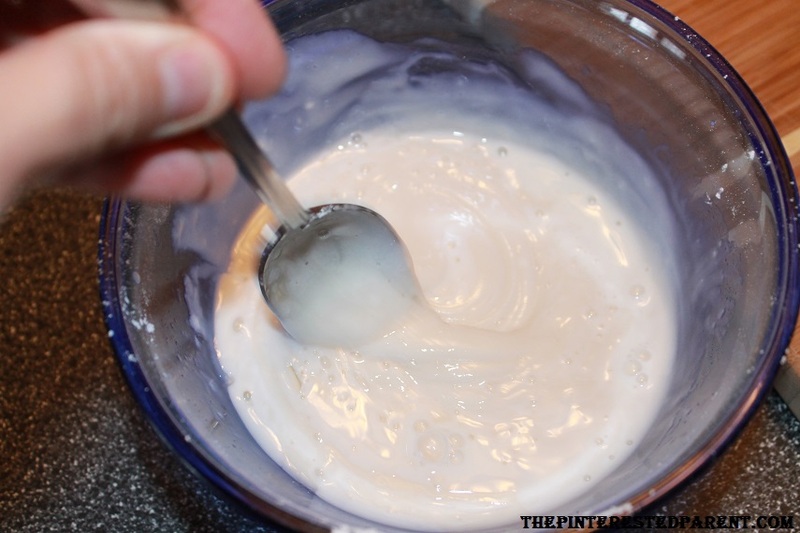 3.Remove from heat & slowly stir in cereal until evenly coated with marshmallow mixture. 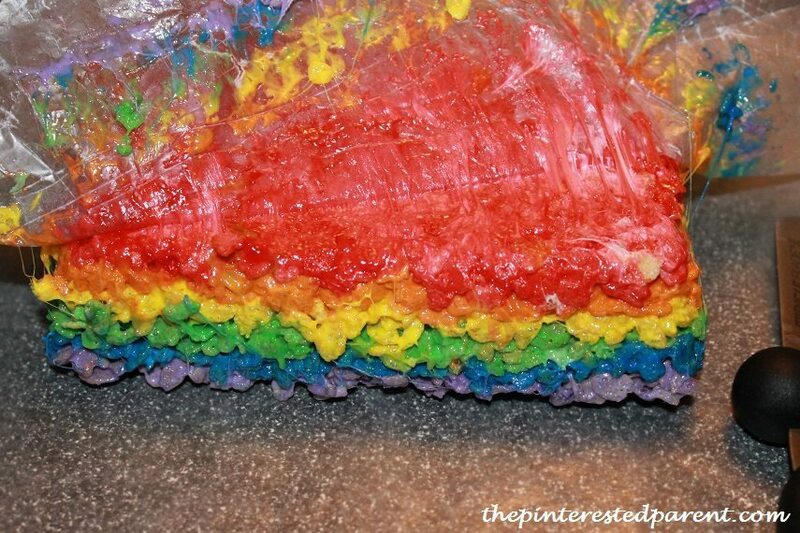 4.Lay down a layer of wax paper to work on. 6. 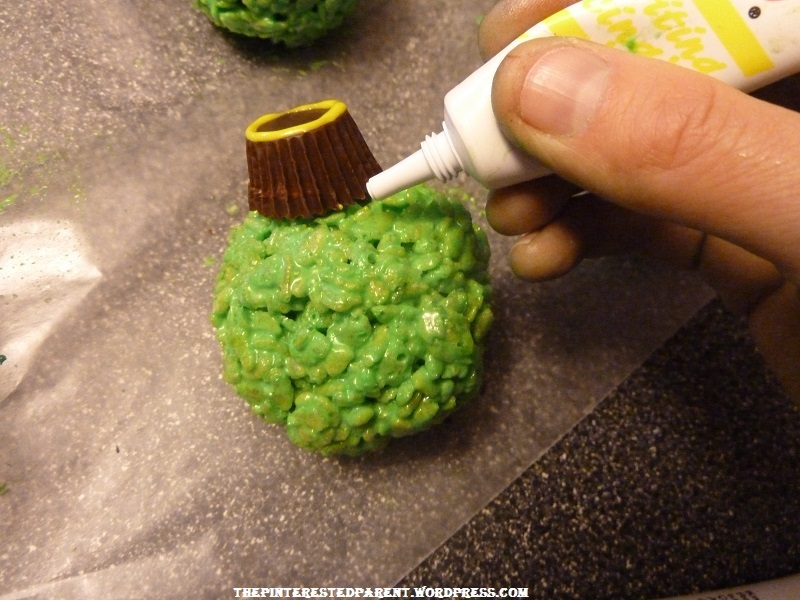 After all triangles are formed & cooled, use icing to add a peanut butter cup to the base. 7. 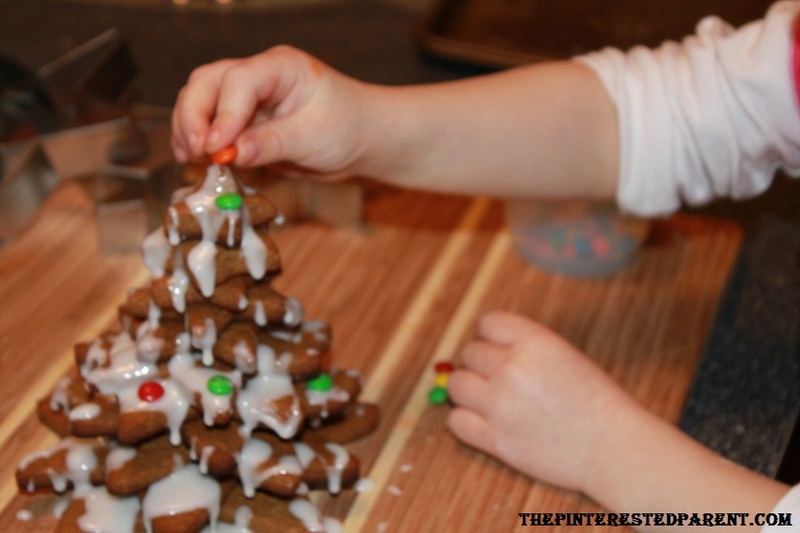 Add a yellow M&M mini to the top of the tree, adhering it with icing. 8. 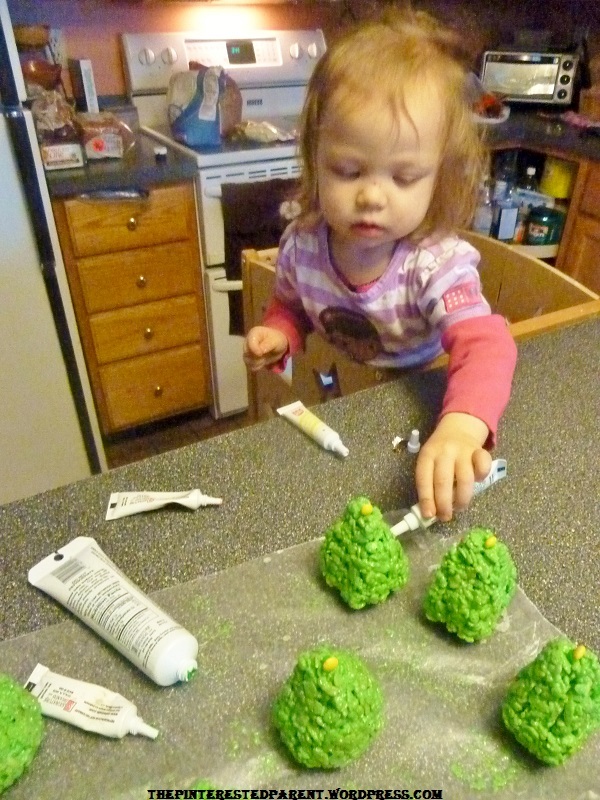 Use red & green icing to dot on the ornaments. 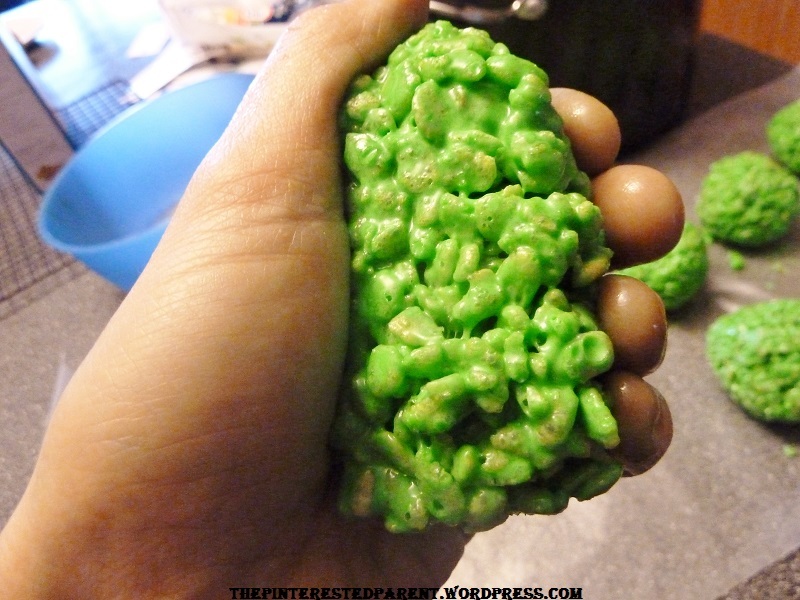 Wet hands & form fist sized balls with Rice Krispies treats. 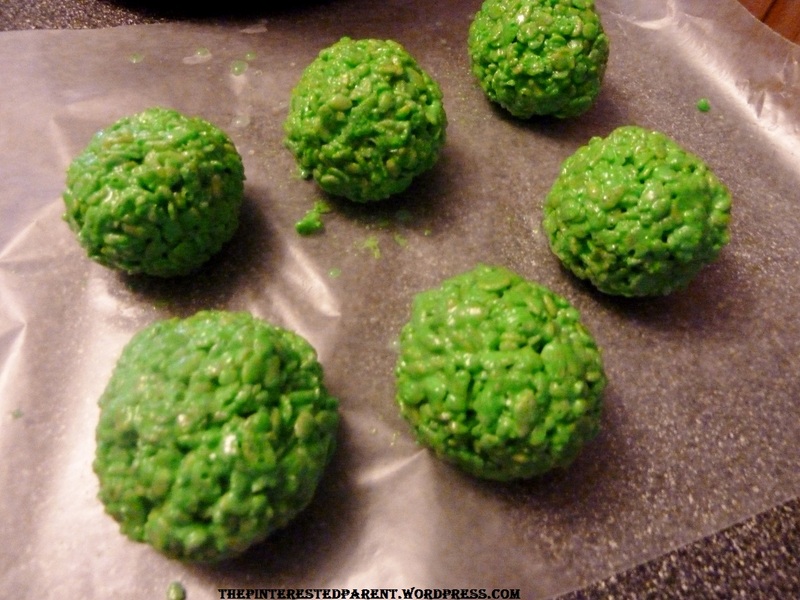 After using all of the mixture to form balls, set aside to cool. 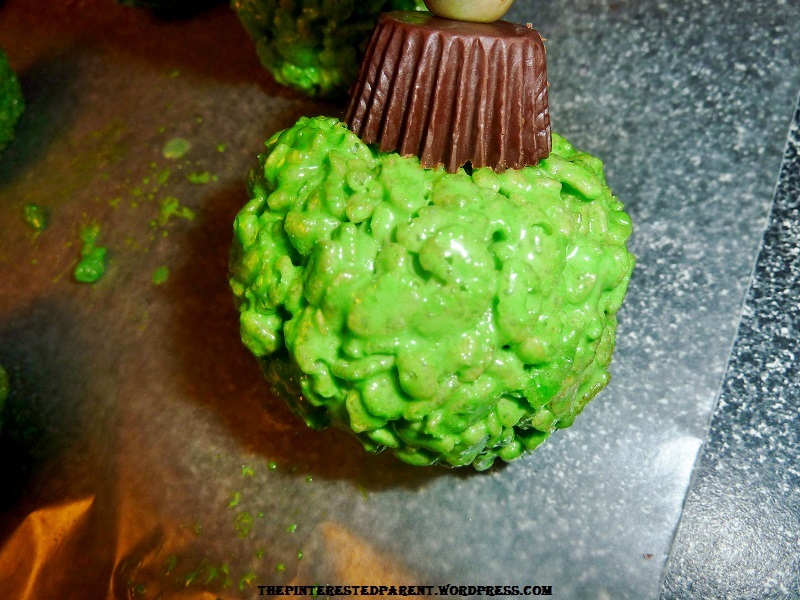 Use icing to adhere a peanut butter cup to the top of each ball. 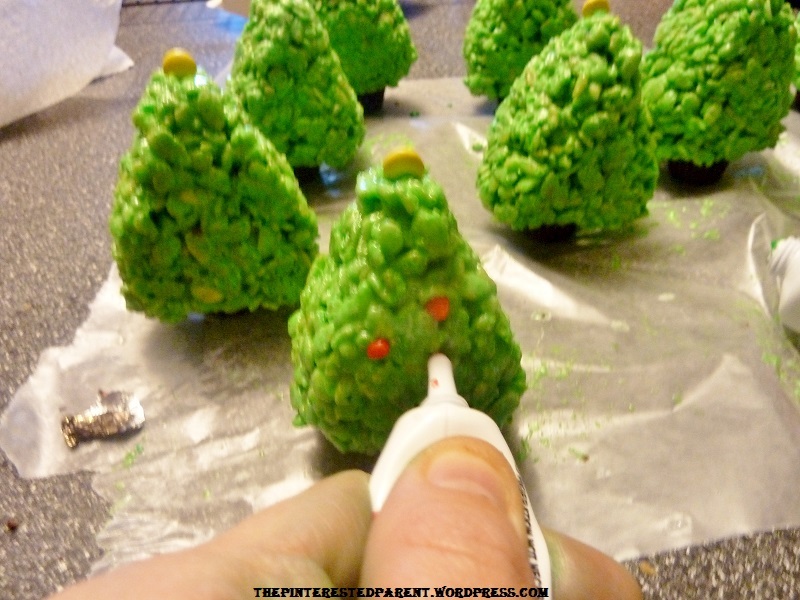 Use icing to decorate your ornament. 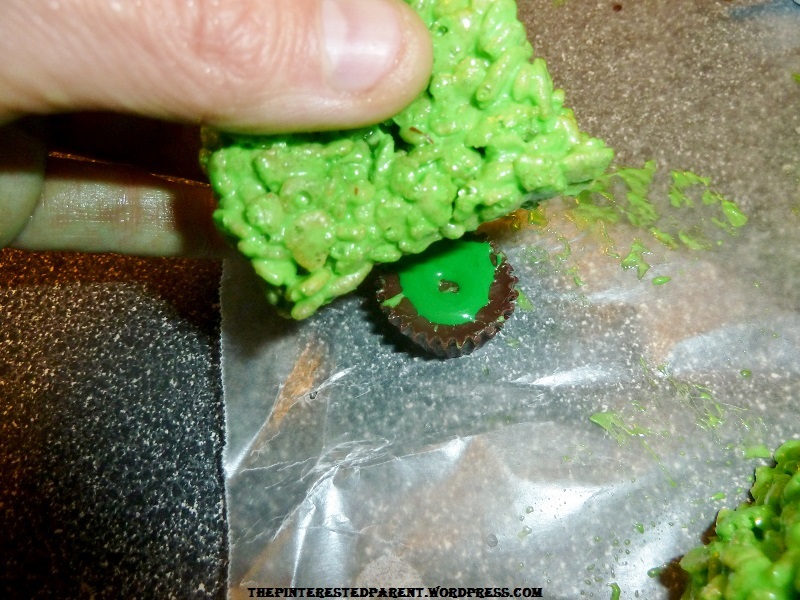 With icing secure a Cheerio to the top of the peanut butter cup. Don’t forget to thank your favorite helper. Serve the treats to your hungry family & enjoy the smiles. Meal times are a stressful time in our house. 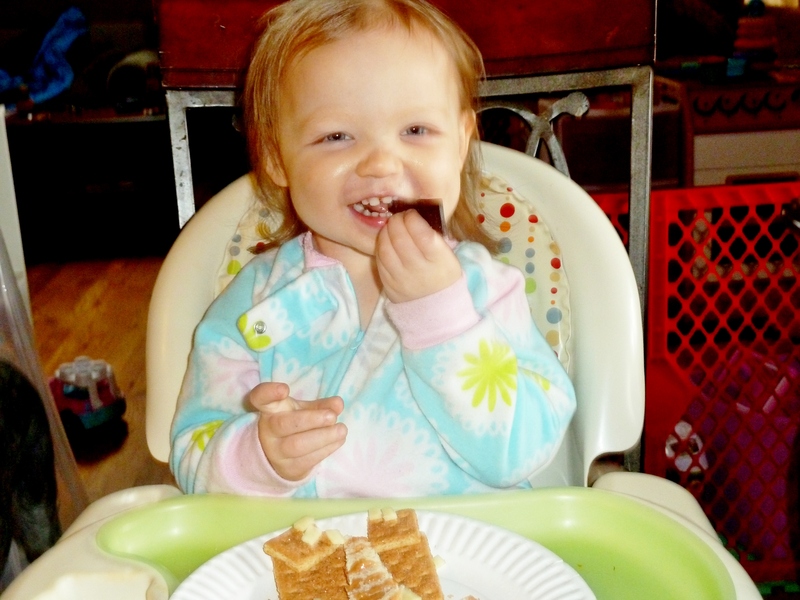 My daughter is not the most cooperative eater and it is often a high point of anxiety for myself and my husband. She goes in phases. Sometimes she will surprise me & eat well for 3 days in a row. I get hopeful and think maybe we have had a breakthrough and then she will go into the next 3 days without touching anything on her plate again. 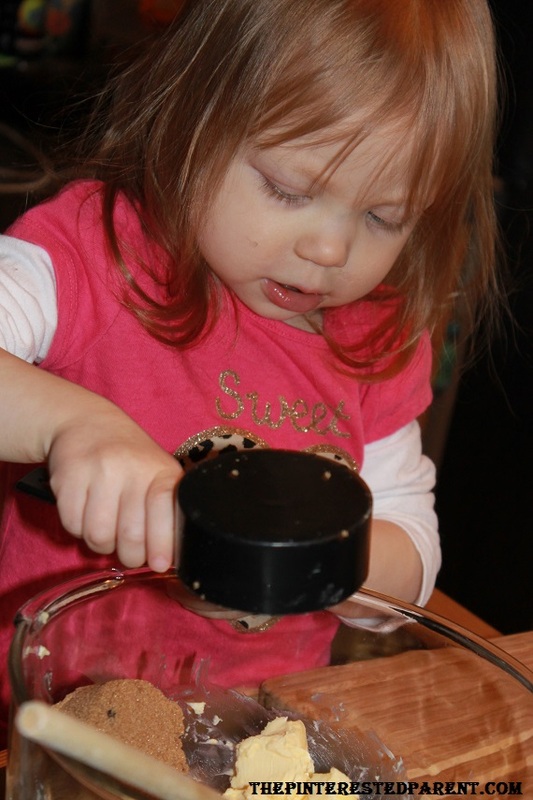 We try to make meal time as entertaining as possible for our finicky daughter. She is a busy little girl and is not a fan of having to sit still for a meal. We often do meal time dinner theater, where we read to her as she eats. She has a favorite selection of books reserved just for mealtime. I am always trying different ideas to make meals more appealing to her. 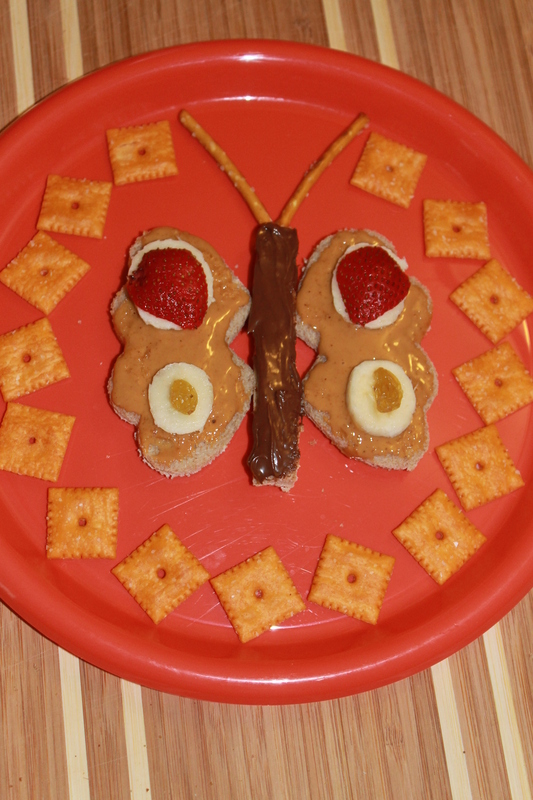 In my Pinterest travels, I have often come across different example of toddler food art. The meals contain different healthy foods arranged to form pictures of animals, cars, cartoons, etc on the plate. This always looked interesting to me. The meals looked cute, but would cute be enough to win over our daughter. Let’s find out. For snacktime we went with owl. 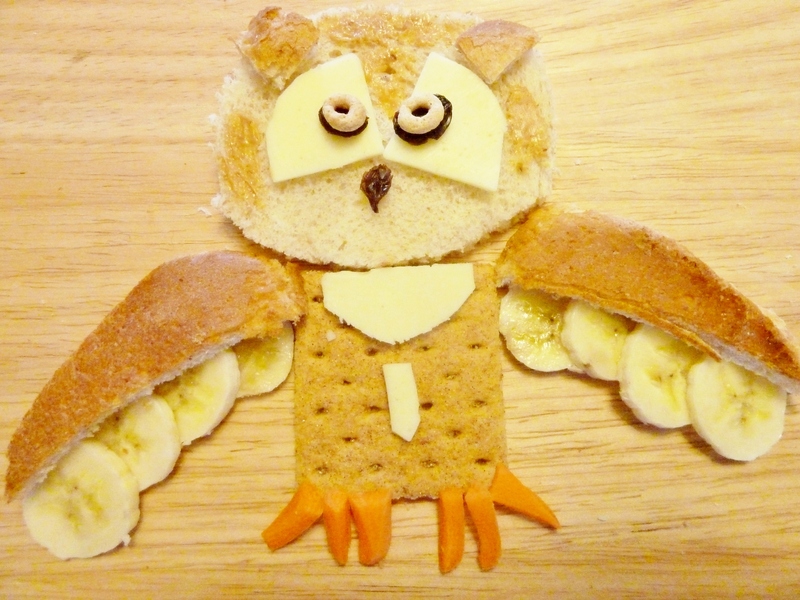 The owl’s head was formed using wheat bread with peanut butter. 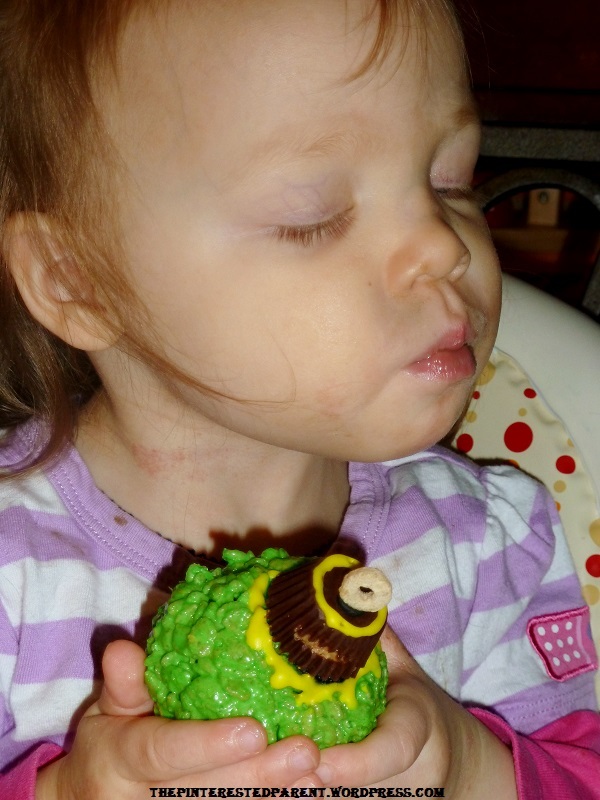 I used american cheese, raisins and Cheerios for the eyes and a raisin for the nose. The body is made with a half of a graham cracker. The wings are formed using a heel of wheat bread and banana & the feet were slivers of carrot. Mommy gave this to Miss Mai . She laughed and pointed and said “bird, bird” and then very promptly looked up at me and said “phant, phant, phant” “Ok honey, an elephant it is. I told you she was picky. I recut and rearranged some of the pieces and added a fruit roll up for the tail. She did like the fun shape of her snack but all our little snacker was interested in was the fruit roll up tail. The shape of your snack has no impact on whether they will eat their meal or not but it will sure make them smile. Bearing that in mind, this was still a fun project & I wanted to give it one more try. Thanksgiving is nearing, so I thought a turkey would be a suitable choice. The turkey’s body & head are again made of bread, but this time I toasted the bread. 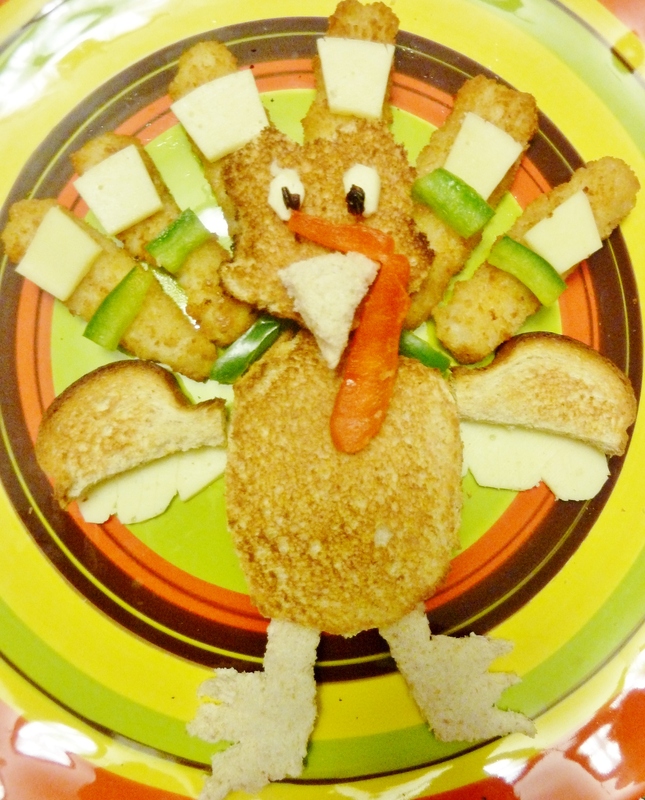 The turkey’s wattle is made from a red pepper and the feathers are fish sticks with pieces of cheese & green pepper. My daughter likes fish sticks and peppers, so this one worked much better for her. Like I said before, this was a fun project. Mai did enjoy the funny appearance of her food & I enjoyed creating them. I will continue to practice this interesting art form.